A lovely unoaked, NSA, Organic Chardonnay in a pretty blue bottle. I have enjoyed visiting Badger Mountain and Powers Winery for nearly 20 years. 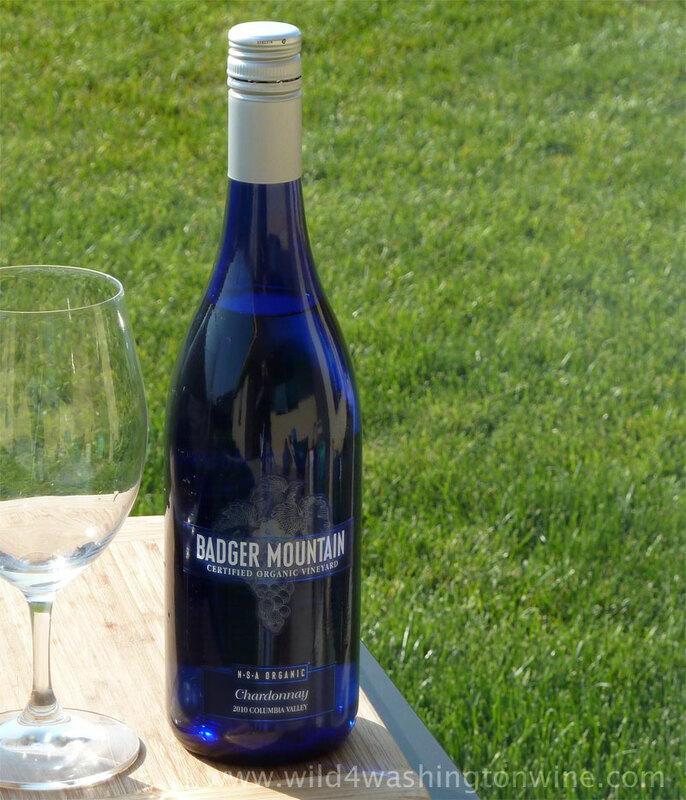 Located in a residential neighborhood, Badger Mountain Winery is the arm of Powers Winery which grows organic grapes and bottles Organic wines. Bill Powers and his family have been crafting fantastic wines for many years. He and his son Greg planted Badger Mountain vineyard in 1982. In 1990 Badger Mountain Vineyard became the first Certified Organic wine grape vineyard in Washington State. In 2010, Bill Powers was inducted into the Legend of Washington Wine at the Walter Clore Center. A visit to this winery can be very rewarding. The solar powered tasting room has a fantastic selection of Badger Mountain and Powers white and red wines; and some of the best hospitality. Outside you’ll find a lovely green area with picnic tables for, well…picnics. The next time you visit the Tri-Cities, do not miss visiting this winery. If you have never visited the Badger Mountain and Powers winery, it can be challenging to find – use a map to locate it before you head out. Map to the winery. 100% USDA Organic Certified grapes, grown in deep volcanic soil. Color: Pale gold, clean, clear. Nose: Pear, kiwi, honeydew melon, banana. In the Mouth: This wine drinks young, as in bright and lively. It’s deliciously crisp, reminding me of a just picked green apple, melon and banana swirl in the mouth. On the finish, the pear, kiwi and melon re-emerge. A honey aftertaste lingered on the palate for many minutes – smelling the empty glass, I’m detecting sourdough bread. This bottle is sealed with a screw-cap, which makes it easy to open so you can enjoy it faster. As always, Badger Mountain Winery has produced a crowd satisfying wine. It’s tasty, food friendly, Organic, NSA and shows off well in its pretty blue bottle. 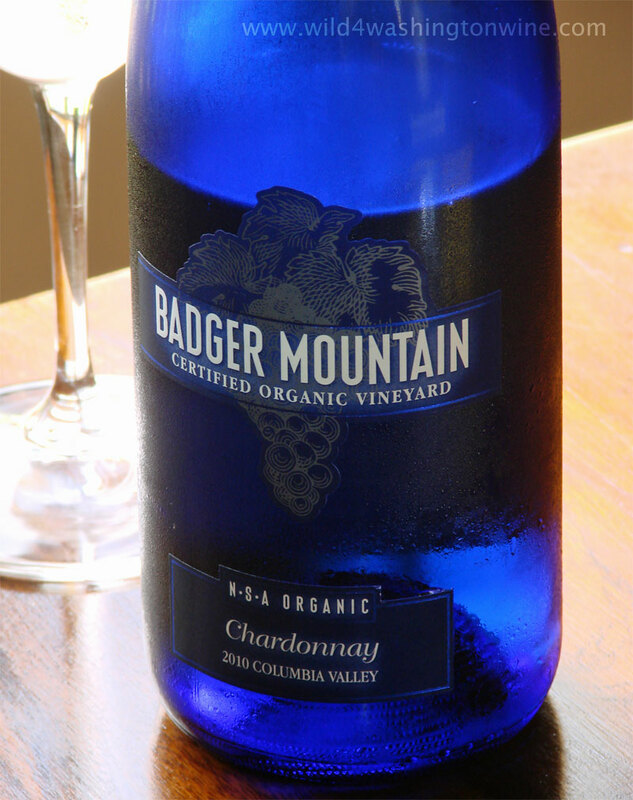 Recommended, go find some 2010 Badger Mountain NSA Organic Chardonnay and share it with your friends. Winery Notes: Vineyards: Badger Mountain and Arete, Columbia Valley AVA, Fermentation: 100% Stainless steel in upright fermenters, no Malolactic Fermentation, Bottling date: 11 April 2011, 13% alcohol, 4,600 cases produced. Sample provided by the winery. This wine is labeled NSA (No Sulfites Added) only naturally occurring sulfites are present in this wine. Yeast naturally produces sulfites during fermentation. "...even if no sulfur dioxide is added to wine, fermenting yeasts will produce SO2 from the naturally occurring inorganic sulfates in all grape juices.” More information on Sulfites in Wine. Organic wines are produced using organically grown grapes. No pesticides, herbicides, fungicides, chemical fertilizers, or synthetic chemicals of any kind are allowed on the vines or in the soil. Strict rules govern the winemaking process and storage conditions of all imported and domestic wines that acquire certification. Moreover, organic winemakers often avoid many of the chemical substances used to stabilize conventional wines. Additional information on Badger Mountain organic farming and produciton. Video review: 2010 Badger Mountain NSA Organic Chardonnay. I checked with the winery, they do not have a distributor in Hawaii. Sorry.